APEL Extrusions Limited is a full-service extrusion manufacturer that specializes in aluminum extrusion and finishing. APEL was founded in 1972 in Calgary, Alberta, Canada and since has expanded its presence to Coburg, Oregon. With its headquarters and production facility in Alberta, and factory in Oregon, APEL services both western Canada as well as the western United States. 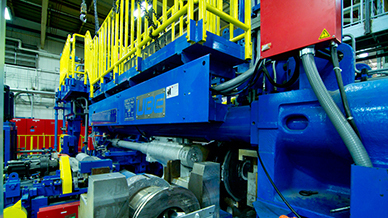 APEL takes pride in being one of the very few full-service extrusion shops in North America. APEL provides all services under one roof in order to maintain its customer focused organization. The aluminum extrusions that APEL manufactures can be used in a number of applications such as, residential and commercial construction, HVAC systems, recreational vehicles, consumer goods and more. The aluminum extrusion industry is seeing an increase in demand for flat rolled and extruded aluminum products like never before. This is due primarily to the transportation sector. This trend is expected to continue through 2020, with a majority of the demand in North America coming from the automotive industry. With the increased demand for aluminum extruded products, companies like APEL are expected to adapt to the wants and needs of customers while continuing to provide quality solutions that exceed extremely tight tolerances. For APEL, a critical step in being able to provide a high-quality product for its customers comes long before the actual extrusion process begins. APEL puts a high value on designing business solutions that meet its customers' needs. With this objective in mind, the company believes that extensive research is a crucial part in its overall extrusion process. APEL dedicates many resources including both time and money on scientific research, instrumental development and die performance research. “The problem in conducting and executing research in die performance is having to buy new tooling, prep the material and press, and run the test, all with the possibility of the extrusion failing,” explains Tony DaSilva, Vice President, Operations of APEL Extrusions. 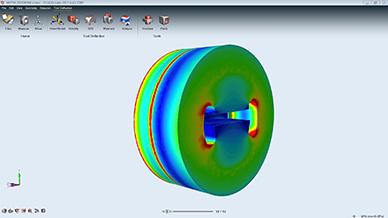 By utilizing Click2Extrude, APEL was able to run numerous simulations in a short period of time to better determine the outcome of specific die designs. Employing the extrusion simulation software, Click2Extrude to simulate the extrusion process prior to production. 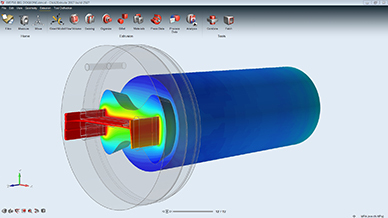 APEL continues to explore the extrusion simulation based environment of Click2Extrude while running simulations, evaluating die strengths and weaknesses as well as learning how to better use the software within their processes. The Extrude Process Tool is another valuable feature within Click2Extrude that APEL hopes to employ in order to more accurately quote future projects. Founded in 1972, APEL is a full-service extrusion manufacturer serving markets in western Canada and the western United States. With 40+ years of experience, APEL is a modern North American extrusion company that has made a commitment to continued on-going investment in new equipment and capabilities to meet the current and future demands of the markets it serves. APEL’s quality system meets ISO 9001 – 2008 requirements. 7929 – 30th Street S.E.